Up until recently, I was blissfully unaware that a creature may proliferate during a specific season, just as a fruit or vegetable may have a small window of sudden abundance. That was, until a family of these gelatinous creatures descended upon my kitchen without warning. Gravitating towards the fridge, they seem happiest near a readily available source of food, and seem wholly uninterested in moving on to warmer shores. Far from threatening and actually quite cheerful, I see no harm in letting them float about in the comfort of a safe environment. Miles away from pesky beach goers and without a care in the world, it may permanently be jellyfish season in these parts from here on in. It couldn’t be easier to whip up a whole swarm of these sting-free softies. Simply print and cut out the template, trace the shapes on your desired color of felt, and carefully trim the fabric. 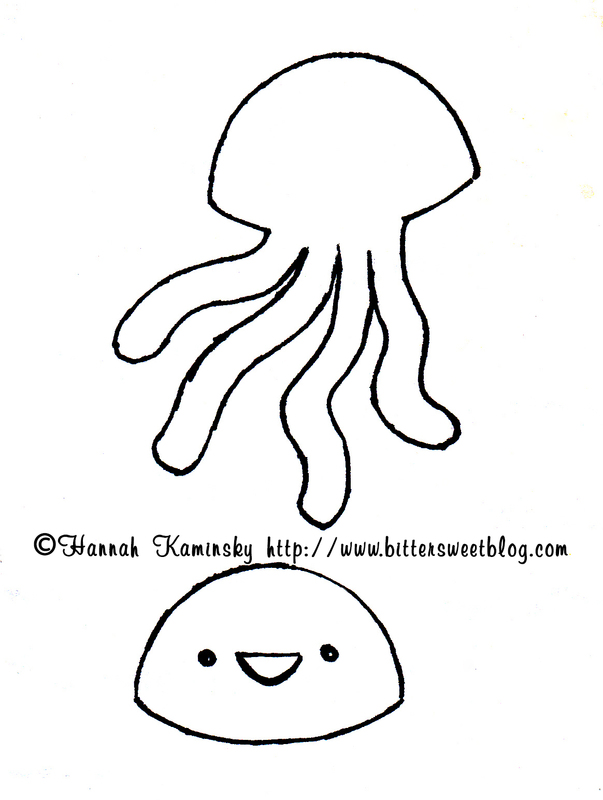 Glue small eyes and embroider a happy smile on the plain head (without the tentacles). Use a matching color of thread to whip stitch the head to the head with tentacles, pausing as you reach the end to very lightly stuff it with batting. Glue a magnet to the back, stick it on the fridge, and admire your handiwork. Previous Post Yay or Nay? made me smile. thank you. to cute. These are adorable and my kids will love them. They are definitely going on our list of things to make this summer! Oh my goodness, these are so cute!!! Adorable! And so easy to make, too. I may make some in the future for stocking stuffers or something! Aw I love these, they are so cute! Oh they’re so cute! ‘ll certainly do a few for my boyfriend who likes jellyfish so much!